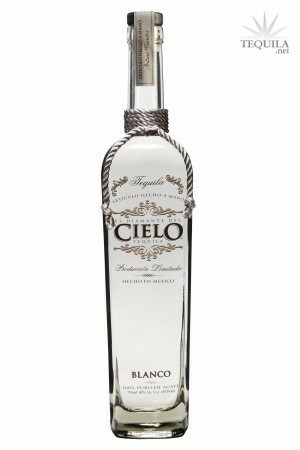 El Diamante Del Cielo Blanco Tequila - Blanco Tequilas go straight from distillation to the bottle making them the purest, but freshest of the Tequila family. 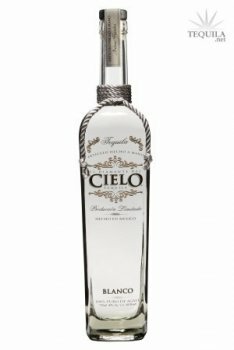 When creating triple distilled Cielo Blanco, the head and the tail of every batch is discarded and only the purest part, "the heart", is bottled. This leaves only the natural floral, herbal and peppery flavors which is good for sipping, but better as a mixer. Appearance is bright and clear, harsh nose with agave and grass. Pleasant initial taste, tangy citrus and floral undertones, and a hint of chocolate. Smooth and simple finish, slight butter, and grassy spice aftertaste. This blanco is translucent in color with a sight yellowish hue. It has a nose of sweet agave, but also a slight chemical fragrance that remains constant throughout the tasting experience. The taste has continued sweet cooked agave, but more of the chemical essence - kind of a soapy, plastic taste. A medium body - probably its best attritbute. There are characteristics of a good finish with a nice medium duration, but the lingering chemical taste takes away from it. There are some nice aspects to this tequila, but there is an underlying chemical taste that personally turns me off. The taste is actually typical of other NOM 1472 products that I have tasted. The price on this varies widely from $30-$40 for the blanco, but personally, there are other brands I would rather spend that kind of money on. Very attractive bottle made of heavy glass with a good cork and stopper. Tasted 08/09/08 out of snifter. Diamante blanco is a decent tequila. It has both harsh and mild aspects to it. I would use this one as a mixer, as well as a sipper. Although, as a sipper, it wouldn't be at the top of the list. Somewhere near the middle. Aroma: A light nose of floral smoke and earth. Initial Taste: On tip of tongue its sweet with some bitterness. An oily mouth feel. Body: A creamy/vanilla like agave body, with hints of citrus, floral, and smoke. Clear in color, El Diamante Del Cielo Blanco is a smooth but weak flavored silver. The nose is peppery with mild tangerine/citrus notes. It is light in the mouth with mild agave flavors. The finish is smooth and slightly oily, with a minty aftertaste of medium duration. Overall this is one of those tequilas that I would recommend to people who are "unsure" if they like the taste of agave or not. There is nothing overpowering about El Diamante Del Cielo Blanco. It's just a nice, mild tequila. Cielo Silver NOM 1472 Tasted 4/18/07. The tequila is clear in color and has intense earth, spice, and floral aromas. Once you get past the intensity of the nose, you can smell moderate notes of fruit and pepper. On the tip of the tongue the tequila is mellow and soft, while feeling somewhat thin in the mouth. While the tequila is sweet, it is actually has a hint of bitterness. Now onto flavor. The flavor has intense floral and agave attributes which are followed by moderate fruit, vanilla/citrus, and earth. The tequila also has mild spice and smoke. The tequilas finish is a medium duration of flavor followed by a numbing and tingly alcohol feeling. Overall, I rated this tequila at the B+ level.